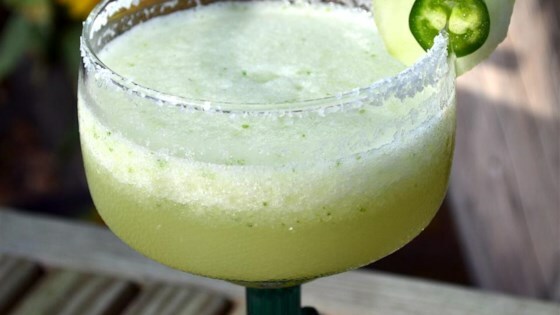 "Nothing tastes better than tequila and jalapeno; the cucumber adds a freshness that helps to mute the jalapeno's bite. The longer it chills, the more jalapeno and cucumber infuses into the tequila. Serve over ice in a salt-rimmed glass, garnished with cucumber slices." Run a wedge of lime along the rim of each of four pint glasses. Spread kosher salt onto a flat plate; press glass rims into salt to coat. Fill glass with ice and pour margarita over the ice. Garnish with cucumber slice. OMG...I put in half a cuke, then you can taste it. This is good. Nice tasting Margarita with the extra cucumber as others suggested, but yielded only three 1/2 c. (4 oz.) servings. Not quite sure where the four "pint" servings came from.